With all the parties, gifts and baking that goes on this time of year, it can really get to be a burden on the wallet. Things really do add up quickly and if you don’t plan ahead you may find yourself with not enough money to celebrate like you want, but it doesn’t have to be that way. I really do love this time of year and we try to celebrate without spending a whole lot of money. 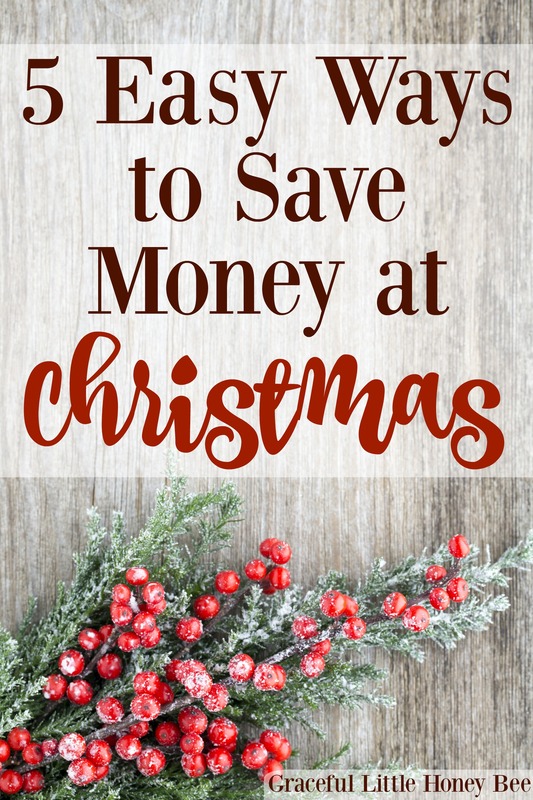 Today, I’m going to share with you my favorite top 5 tips for saving money at Christmas. Enjoy! BONUS TIP: In order to have a stress free, debt free Christmas I would highly suggest adding up what you spend each season on gifts, baking, supplies, etc. and dividing that by 12 which will give you the amount you should be setting aside each month throughout the year. It’s too late in the year to be doing that at this point, but you can still add up what you spend this year to give you a good estimate for next season! This time of year is a great for scoring some amazing grocery deals and really building your food stockpile. Most grocery stores have sales on things like baking supplies, butter (freezes well), ham, turkey, stuffing mix, canned veggies, etc. throughout Nov. and Dec. These things normally don’t go on sale again for six months (around Easter) so buy enough to last you that long and you will save a TON. Also, if you can pair the sales with coupons and/or cash rebates using my favorite money saving apps IBOTTA or Checkout51 then you can get some really amazing deals! Places like the Dollar Tree are GREAT for scoring deals on gift wrap, Christmas cards, decorations, freezer containers and stocking stuffers. I bet you’ll be surprised at the great selection of goodies that they carry this time of year for only $1 each! Don’t be afraid to look for decorations, gift wrap, cards or even gently used or like new gifts at the thrift store. Often times you can even find brand new items with the tag still on them for a fraction of the retail price. Young children especially won’t care (or know) if the items are new or used. They’re just excited to be getting new toys! Another great way to save is to DIY everything that you can. Cooking from scratch with baking supplies that were bought on sale will be cheaper than buying a mix or a pre made treat. Also, you can DIY lots of different gifts that will save you money. Things like seasoning mixes or baking mixes in a jar are fun and inexpensive. And if you have a skill like sewing or crocheting then you can make lots of gifts for really cheap. You can also DIY your own decor using fresh-cut greenery, dried cranberries or pine cones. The last and most important money-saving tip that I have for you would be to focus on the traditions and memories instead of the gifts and parties. Build a snowman, sing Christmas songs, bake cookies, drive around and look at lights. These are the things that will be remembered and they don’t cost a thing. Check out my list of 25 Christmas Activities for Kids for more ideas! I hope you enjoyed these tips! How do you save money at Christmas? I’d love to know! Great ideas, Missy! Each year I try to make Christmas simpler and simpler with less focus on the gifts and more focus on Christ but it can really be a challenge in this over-commercialized world. Our extended family has done a nice job with cutting back on gifts for everyone and just doing gifts for the kids--but even that is too much and overwhelming for them at times! I love doing homemade gifts! I "Christmas shop" all year long. My favorite day is President's Day. Who wants heavy sweaters and flannel shirts when spring is around the corner? $6 for a $60 sweater at Kohl's is about right! A vintage doodad that a friend collects at Goodwill? Into the Christmas bin. Markdowns? In the bin.Yarn on sale; more scarves to knit. Glass jars from food; saved for Epsom bath salts to make for Christmas gifts. Craft supplies I can use to make stuff for friends and the church bazaar. Yeah! Thrifted baskets for theme baskets... The thrill of the hunt is so much fun....so and so will love this,"Wrapping frenzies" include using homemade cloth gift bags with beautiful bargain ribbons and cords, tins I've collected and the cheapest Christmas paper I can find. Gift bags and tissue paper are recycled. Tags are cut from last year's cards. And best of all, it's all paid for long before Christmas!! !t It leaves some extra so we can pull some tags off the Giving Tree at church!